By now you know my visual guidestick: Two's a coincidence, three's a trend. Here we have a coincidence, all the more striking because the galleries are around the corner from one another in the same building and on the same floor. 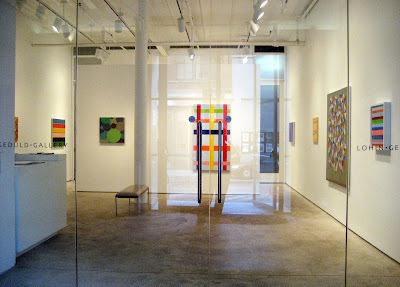 In several key pieces in their shows, Debra Ramsay at Blank Space and David Mann at McKenzie Fine Art (both at 511 W. 25th) are working with similar elements: a symmetrical composition with an "exploded" vertical core, built up through repeated elements, and executed with modulated color and a strong sense of materiality and process. 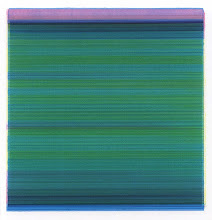 Transparent or translucent color allows you to view each work through a chromatic scrim. 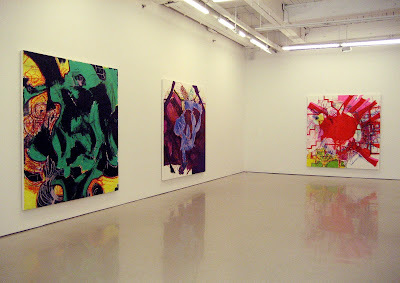 Each exhibition satisfies on its own, but the visual reciprocity enhances the experience. There are differences, of course. 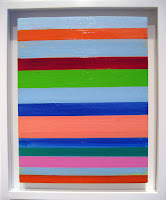 Scale is the most obvious; Mann works larger. Color is another; Ramsay has the more neutral palette. And the materials--acrylic, encaustic--refract the light differently. See for yourself. 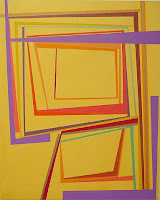 Both shows are up now: Ramsay's through October 31, Mann's through November 14..
Marketing Mondays: The "Adjective" Artist. How Do You Define Yourself? A short while back, a reader with the nom de blog of Quilt Works asked, “Have you ever done features on fiber artists?” Man, did she push a button! Let me start out by saying this: Quilt Works, I mean you no disrespect. 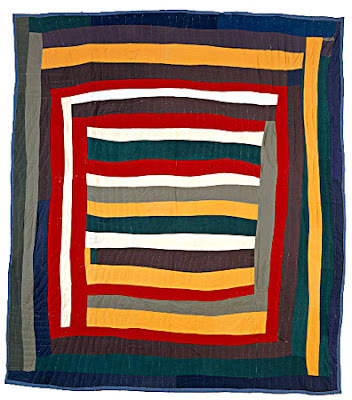 I love quilts and textiles. Amish quilts, Gee’s Bend quilts, Faith Ringgold’s quilts, Alighero e Boeti’s embroidered canvases, and the work in fiber of many other artists, well known or lesser so. So it’s not the medium that pushes my button but the use of the adjective as a means of identification. In one of my first posts for this blog, I wrote my personal manifesto, I Am Not an Encaustic Artist. As I said in the post, I work in the medium because it allows me to express myself in the best possible way, but I don't want to be defined by it. Encaustic is something I use (and love using), but it's not who I am. Those of us who work in particular mediums—whether encaustic or fiber, metalpoint or clay, or any one of a number of other at-the-edges-of-mainstream materials—run the risk of being pigeonholed by the particularity of the material. We didn’t go to “fiber art school” or “metalpoint school.” We went to art school where we tried a variety of materials. As artists we express ourselves in the medium that resonates for us. I’ll bet that Oliver Herring, when he was crocheting his sculptures a decade ago, called himself a sculptor, not a fiber artist (he was just on the cover of the September Art News, by the way). I'll bet Shinique Smith, who works with baled forms, and Peter Weber, who works with folded felt, do not call themselves fiber artists. 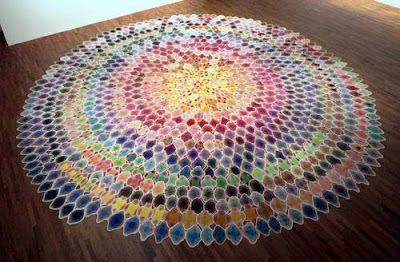 Who has the more visible careers—“fiber artists” or non-adjectival artists like Apfelbaum, Smith, and Weber? "Fiber artists" or Tracy Emin, whose recent work consisted of stitched blankets? 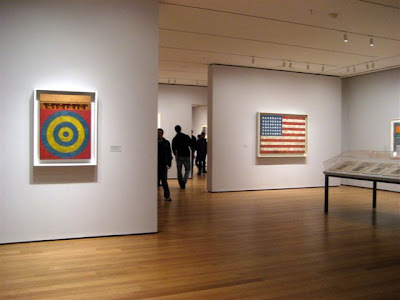 “Encaustic artists” or a painter like Jasper Johns, who employs encaustic in his work? 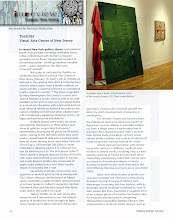 To answer Quilt Works’s question, I have written about artists who work with fiber or fiber constructions. 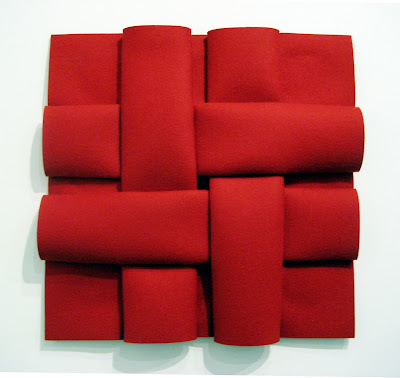 My report from the 2009 Armory week in New York, for instance, included a post called Sew Me the Money, which included Emin’s blankets, El Anatsui’s wall-size bottle-cap constructions (you could easily call them tapestries), Mary Heilmann’s woven chairs, and other work. Interestingly, any of the aforementioned artists who work with fiber could easily be the subject of a feature in a textile magazine, but the reverse does not hold true. How many self-identified weavers, for instance, have you see in in Art in America? There is plenty of work in fiber in those publications, but it's under the conventional art categories of painting, sculpture, work on paper, maybe installation. 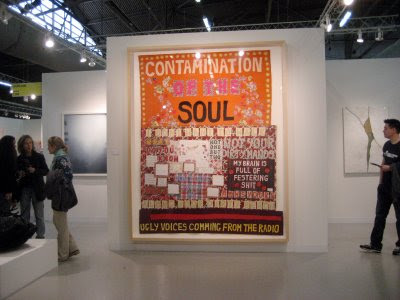 Indeed, when I was looking at some of the textile-influenced work at shows during Armory week in New York, I couldn't help thinking that I've seen so much better by artists who might define themselves as "fiber artists"--but much of the rest of the art world hasn't seen this work because it's sequestered in "fiber" and "textile" shows. I love materiality, and I understand the powerful need for artists to align themselves with others. I have done it myself--and still do when the occasion seems appropriate to me. But as a general means of identification, no. I currently run an annual conference for painters who work in encaustic, and some years ago I edited a magazine called Fiberarts, which is still published. I think the specific focus of a publication or event provides a place for artists who work in a particular medium to show their work to that particular audience, to share information and network. This is true of other "adjectives" as well: women artists, black artists, gay artists, and artists of any ethnicity or culture. It can be emotionally fulfilling, to say nothing of professionally helpful, to align ourselves with others who are who we are, who do what we do. But not all the time; that's a ghetto. Besides, we have many adjectives to describe us; where would it end? Without denying any part of how I identify myself in the world, for instance, it would nevertheless be ridiculous to ghettoize myself artistically as a mid-career Italian-American lesbian feminist encaustic artist. I've come to this point of view over time: The more narrowly we define ourselves, the narrower our opportunities will be. 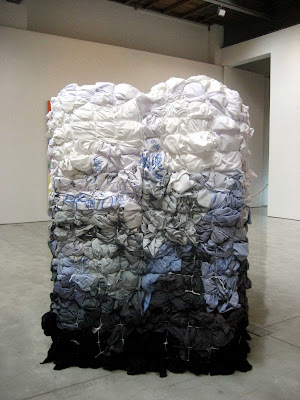 So you can count on me to write about art made with all of all kinds of materials--and to discuss the materials--but without defining the artist by the medium, as much as it is possible do so. Do/did you define your art (or your artist self) with an adjective? Do you you struggle with the "adjective" issue? How do you deal with it? Do you feel you've ever been eliminated, overlooked, or dismissed because of the adjective rather than the work? Do you think you may have limited your own opportunities for grants or exhibitions because of the way you define your art? Or, has it helped you? 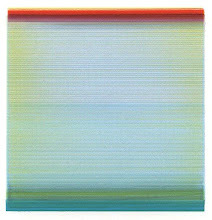 Labels: Use of descriptives like "fiber artist"
With an economy of words, the description of Stripes/Solids on the Paula Cooper Gallery website says simply: "The works in this show, dating from 1962 to 2008, embody a clarity and resolution of line, color and form through simple gestures." I would add that there's a strong sense of materiality here, from the wax in Sherrie Levine's Untitled (Broad Stripe: 6), which you see when you walk in, to Brice Marden's wax and oil monochromes, to Jan J. Schoonhoven's stacked cardboard with the corrugated edges forming the surface structure, to Rudolf Stingel's enormous styrofoam relief. There's also an unexpected river of blue and green that runs through the gallery. .
We're going to tour the large main gallery and then peek into the smaller front room that faces the street. 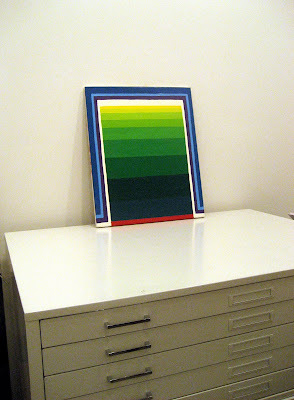 To orient you, the Dan Walsh painting, below, is on the other side of the wall from Levine's. Stripes/Solids is up through October 31.. In this museum-quality exhibition, with one work per artist, the spare installation provides an opportunity to immerse yourself in each work while finding yourself in the middle of visual conversations between the geometric elements. It turns out there's a lot going on with these "simple gestures." As a title, Stripes/Solids is something of an understatement. 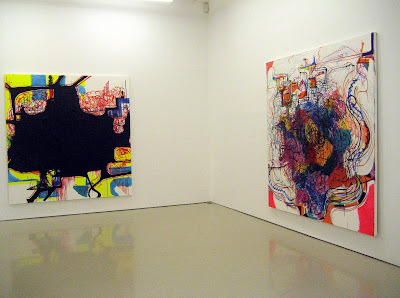 Joanne Greenbaum's paintings hit me right in the solar plexus. Sure, I took them in with my eyes first, but their demanding materiality, almost Day-Glo palette, and agressive compositions produced a visceral response. These are not paintings you "like." You either love them or hate them. I happen to love them for all the reasons just noted. Plus Greenbaum handles paint like nobody's business. 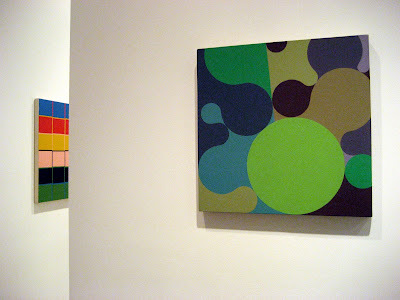 A surprise for me was the work of Elliott Green in the smaller gallery. 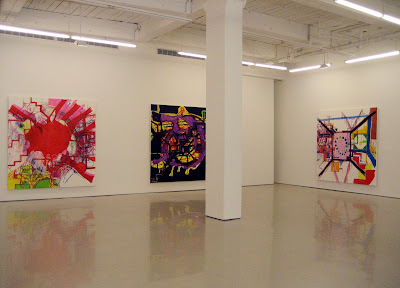 These easel-size paintings, lyrical and poetic, were a perfect fit for the space. There's a narrative in there, I think, but I was content to go with the flow of a purely visual experience. 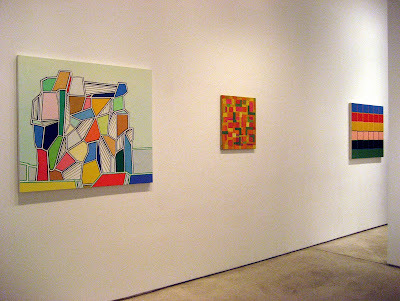 Both shows are up at D'Amelio Terras through October 31. 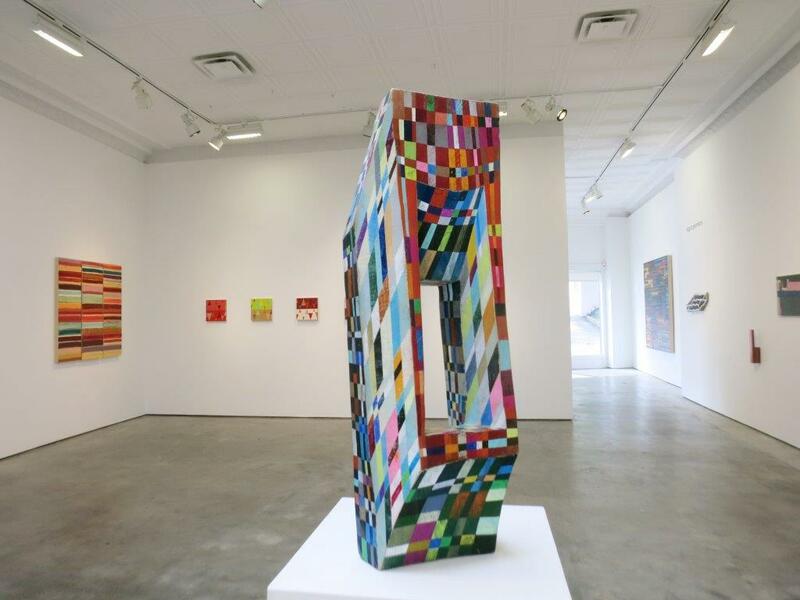 Painters Joanne Freeman and Kim Uchiyama curated a sublime geometric show, Color-Time-Space, for the gallery that represents them, Lohin Geduld, on 25th Street. I'm writing about it on the last day of the show, and you're seeing it posted four days later, but not to worry: I'm going to show you around. In making their selections, the curators noted the relationship between art and music. Rhythm, tone, and visual space (or musical time) are shared elements within the two disciplines. Seeing each perfectly chosen piece initially, I wasn't sure why the premise was necessary. 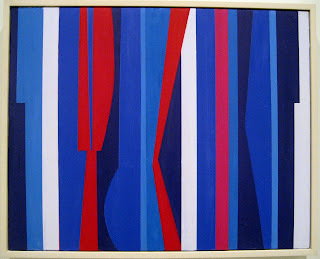 Each work does indeed have a visual musicality, but the visual relationships between the works are substance enough. Yet as I think about the installation, I can see how well orchestrated it is. 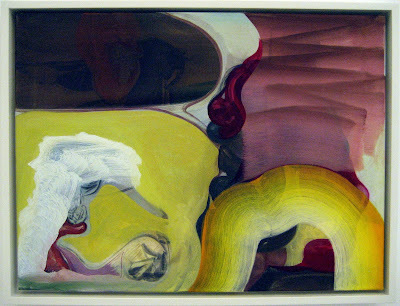 Flat, saturated color is a feature of each painting, amplified and echoed in a kind of high-volume harmony in relation to the others. 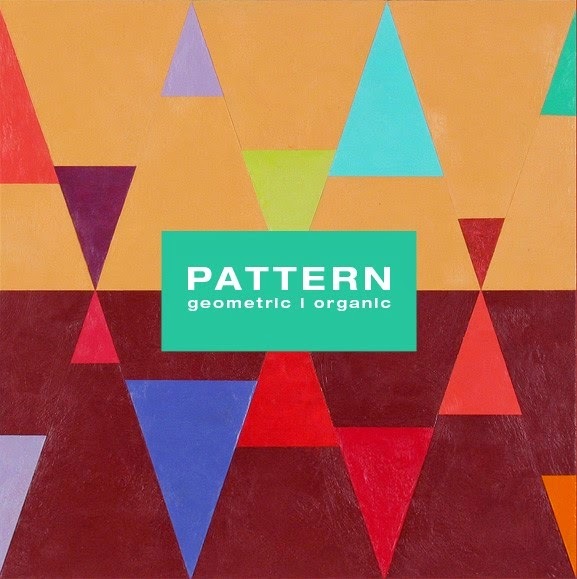 More persuasively, each work has a percussive rhythm in its repeated geometry--rectilinear, angular, banded, curvilinear, pah pah pah, pah pah--a polyrhythmic syncopation as the angles and curves pulse and snap. Starting with the view through the window, above, we're going to swing to the right: . 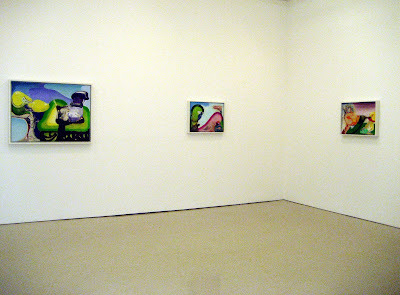 James Biederman, Ben LaRocco and Kazimira Rachfal were also in the show. You can see images of their work on the gallery website. (Rachfal, a lovely surprise.) 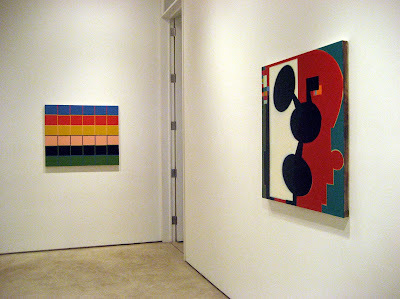 A second part of this curatorial effort took place at the Janet Kurnatowski Gallery in Brooklyn. On the sidebar of this blog, right, you might want to try out the new "Search This Blog" feature. 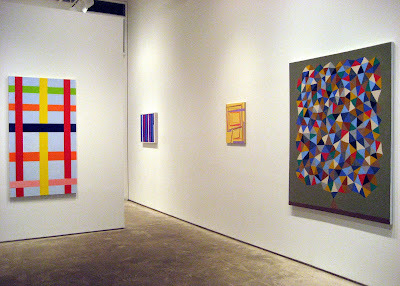 I've written previously about a number of the painters in this show. Type in any one of these names for more about them: Joanne Freeman, Julie Gross, Ben LaRocco, Gary Petersen, Jennifer Riley, Stephen Westfall, Thornton Willis, Kevin Wixted. "We're not taking on as many new artists. We feel responsible to the artists we represent." While the Dow has begun to edge up and there seem to be a few more red dots in the galleries, the art world is still reeling from the recession that began 13 months ago. Gallery closings and relocations continue, and many artists who once had representation now do not. I posed five questions to 40 art dealers around the country—half from New York City, and half from elsewhere. The 12 responses I received, representing that geography in about the same proportion, are not enough to provide a statistically accurate current picture, but anecdotally they create a good sketch of how dealers are considering artists now, particularly because the responses are of a piece with informal conversations I’ve had with dealers in Chelsea and elsewhere. 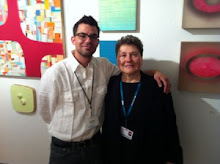 Leigh Conner, principal, Connor Contemporary, Washington, D.C. While some dealers are continuing as before, at least 50 percent of our respondents—and by extension, I’d guess a similar percentage of dealers nationwide—are retrenching in some way. As they take fewer chances, there are fewer spots for new artists. Newly minted MFAs, not so long ago the darlings of the dealers, are now more of a liability because they have no experience working with a gallery. Q: Has the current economy changed the way you consider artists for your gallery? The responses are almost evently split.
. Leigh Conner matches and ups McKenzie’s optimism: “The economy has not changed the way we consider artists for your program. As a gallery we are always looking to the future—five, ten years down the road.” . 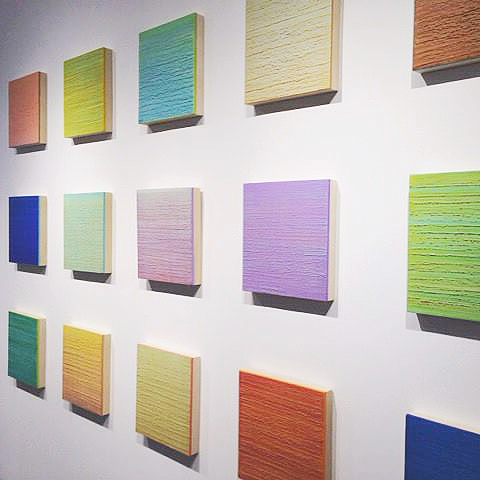 Q: Even though you may not be actively seeking artists for your gallery, you always have your eye out for new talent. Where might you look for and where you have found artists to exhibit? The number-one way they find artists: recommendations and referrals. If you haven't been networking, this should noodge you into doing so. Art fairs are also up there on their list. This may seem unfair if you're trying to get your foot in the gallery door, since artists shown at those art fairs are already in someone's gallery--but not all of the exhibiting galleries are big-city venues.
. Gregory Lind: “One, seeing an artist’s work exhibited at a gallery or sometimes at an art fair; two, through one of my artists or other artists I know; three, although seldom, receiving a submission per email or packet.” He also admits to coming across the occasional artist while navigating the net. 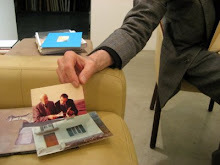 Q: Many artists think that an invitation to join a gallery happens in a snap. What does it take for an artist to be invited to join your roster? Typically, time is the main ingredient, followed by a positive client response to the work.
. Chelsea Dealer B: "It can take years. We will sometimes work an artist into a group exhibition to learn how well we talk about their work, how well we work together, how much interest there is among our collectors."
. 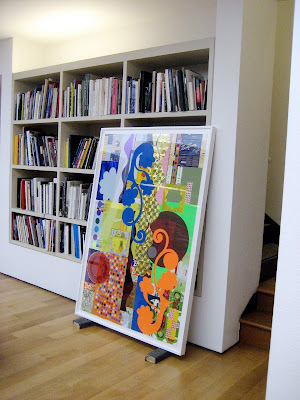 Chelsea Dealer A: "It's the unique quality of the [artist's] work and how it fits into the gallery's program. It's evidence of consistent dedication to their work and career." But more than that, he points out, "Since the gallery is already working with a number of artists, there has to be room for someone new, and the dealer has to be able to dedicate the time and resources necessary to develop the artist's career." “The art world is ultimately very small, first and foremost a community. " This 34-second video is the best example of karma you're likely to see in a while. Listen for the screeching of tires. Go granny.